In April 2013, the Turkish government launched an easy online visa system that issues an e-Visa instead of the old “sticker visa”. The e-Visa document can be obtained online in as little as 15 minutes. Once the information and payment is submitted, the visa is emailed to the traveler, and must be downloaded and printed out. The e-Visa should be shown to airport and customs officials in Turkey and kept safe for the duration of the stay. The e-Visa means no more going to local embassies or waiting in line at the airport to obtain a visa. The government of Turkey has made the e-Visa extremely simple for travelers of over 40 countries. There are an additional 60 countries that can apply for an e-Visa, but must meet certain additional requirements such as having a valid visa or residence permit from the Schengen, Ireland, United Kingdom or United States. Some countries also have age restrictions. The easiest way to view the requirements for these 60 additional countries is to visit our application page and enter your nationality. Your passport or travel document with an expiration date at least 60 days beyond the “duration of stay” of your e-Visa. Certain nationalities require a supporting document such as a visa or residence permit from the Schengen, US, UK or Ireland. To view which nationalities, please visit our application page and enter your nationality. The maximum stay for your Turkey e-Visa ranges from 30-90 days, depending on your nationality. See the table above for more information. The e-Visa is valid for 180 days from the issue date (usually same-day processing). If you apply outside the 180 days, we will hold your application and apply at the appropriate time. This means you can apply at any time. The e-Visa for Turkey is a single or multiple entry visa, depending on your nationality. Please see above table for exact information. You will need to apply for a new visa if the information provided during your visa application is different from the information on your passport. Certain nationalities require a supporting document (visa or residence permit) from Schengen or from US, UK and Ireland. To view your requirements, please visit our application page and enter your nationality. The date of issue of the supporting document should not be later than the date of your trip. The Turkey e-Visa is only valid for tourism and short business trips. You must carry your passport or travel document with an expiration date at least 60 days beyond the “duration of stay” of your e-Visa. For example: In order to enter Turkey using an e-Visa with a 90-day “duration of stay”, the traveler must hold a travel document valid for an additional 60 days, which totals 150 days (90 + 60 days) of validity at the time of entrance. Immigration officers at the borders will stamp your passport when you enter and when you leave, so we advise you to have enough pages in your passport. When your e-Visa expires, you are not allowed to apply for a new e-Visa without departing Turkey. Travelers who arrive at sea ports and intend to visit the seaport cities or nearby provinces for tourist purposes are exempt from a visa, provided that their stay does not exceed seventy two (72) hours. This e-Visa is an authorization document that allows visitors to enter Turkey. The cost ranges from 0.70 USD to 80.70 depending on your nationality. Please use our visa checker to find out the cost for your specific nationality. Additionally, there is a service fee of 20 USD for standard processing. For rush processing and super rush processing the service fee is 40 USD and 60 USD, respectively. What conditions must the applicant’s passport meet for the Turkey tourist visa? 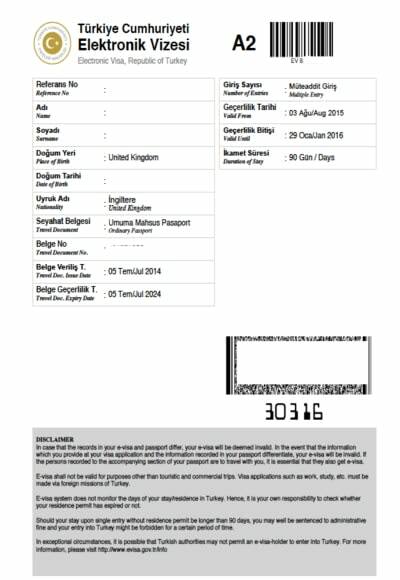 Applicant’s passport should have at least 6-months validity from the time of entry into Turkey and at least one blank page. Travelers who arrive at seaports and intend to visit the seaport cities or nearby provinces for tourism purpose are exempt from visa, provided that their stay does not exceed seventy two (72) hours. However, if you arrive in/depart from Turkey by air for your cruise tour, you must obtain a visa. Is the Turkey e-visa for a single entry or multiple entries? Can I stay in Turkey for longer than the validity period of the e-visa? If you wish to stay in Turkey longer than your e-Visa permits, you must apply at the nearest Provincial Directorate of Migration Management for a residence permit. Do I need to obtain a separate e-Visa for the people accompanying me? No. You must leave Turkey and obtain a new e-Visa. If you need an extend your stay beyond the maximum days allowed/e-Visa validity period, you may apply for a residence permit at the Provincial Directorate Migration Management office. What nationalities are eligible for a Turkey Tourist e-Visa? If I am asked to provide a visa or residence permit from Schengen or US, UK, and Ireland, what requirements are there? The only requirement for your visa/residence permit to be used as a supporting document is that it needs to be valid on the date you enter Turkey. Turkey is a country that has a lot of history, and the people there are very proud of it. Of course, you may have heard in the media that some bad things happened a while ago. Something about a coup d’etat. However, that does not mean the country is not safe for tourists. In fact, that has not changed at all, which is why Turkey receives a lot of visitors each year. If you want to go there as well, you should know that there are plenty of places and traditions you can enjoy. The Turkish people are generally welcoming, and you will know that every single time you are offered a cup of tea. Before you leave, there are some rules you need to follow. Just like in any other country you may go to, you need to know a list of dos and don’ts. It is traveling 101. You cannot travel without knowing what you are allowed and not when you visit a new location. With that being said, here is what you need to know before going to Turkey. The first thing you need to be aware of is that you need to follow a dress code. As you may very well know, Turkey is a country mostly populated by Muslims. Even if you are a tourist, you cannot walk around wearing just about anything. There are no specific rules for men, but women should always wear clothes that cover the shoulders and the knees. Also, if you are a woman and you want to visit a mosque, you need to have a scarf that you can cover your head with before entering. Another rule about entering a religious site is that you cannot keep your shoes on, regardless of the gender. Speaking of restrictions, Turkish people frown upon public displays of affection. It may seem odd to you, but they do not like seeing people kissing or hugging in public. It is okay if you and your partner are holding hands, but that is just about it. However, Turkey is not a country known for its tolerance for LGBT couples, so even if it is just holding hands, they will still give you a dissatisfied glance. If you ever find yourself in Turkey during the Muslim’s month of fasting, which called Ramadan, you should avoid eating in public from dawn until dusk. You do not have to fast with them, of course, but you should at least respect their tradition. They are holding this tradition very dearly, and you do not want to show disrespect. Leaving restrictions aside, there are a whole bunch of things that you can do in Turkey that will entertain you. You cannot visit Turkey without going to one of their famous bazaars. The smell when you get there will make you want to live in one of those markets. You can find all kinds of things from souvenirs and other merchandise to spices and pastries. And the pastries are to die for. You need to try their baklava. You will never manage to replicate the recipe, no matter how much you try. When visiting bazaars or other markets, you should probably prepare your skills. Turkish people love to bargain, and if you see products that do not have a price tag on them, it means that the seller expects you to give an offer. It can be fun to bargain with a Turkish vendor, just make sure that you let him or her know that you are doing it for fun. You do not want to leave the impression that the products on sale are not worth their value. At the same time, you can expect to be ripped off once or twice. The prices will not be the same during different tours, and in Turkey, it is all about connections. However, do not take it as an insult. Treat it as experience and move on. There is no need for confrontation or anything. Your loss is not worth the conflict. Food in Turkey is absolutely delicious. The Turkish cuisine can satisfy all diets, and if you are a vegetarian, you should probably know that the people there can make any vegetable taste amazing with some olive oil and spices. When you are invited to eat with someone, it can be construed as rude to not eat everything on your plate. The thing is that Turkish meals are pretty significant, but since the food is delicious, you should not have too many issues leaving your plate clean. You will be drinking a lot of coffee and tea in Turkey, but try to avoid tap water since it does not have the best quality. Especially if you have a sensitive stomach, it is recommended that you always buy bottled water. Remember that Turkey is more than Istanbul, Ankara, and other such large cities. There are beautiful landscapes all over the country, and you should not limit yourself to the urban areas. Sure, you may not have the same facilities, but keep in mind that Turkey has mountains and sea. You can take a tour through nature and admire the beautiful scenery. If you want to lay on the beach all day, one of the tourists’ favorite is Antalya. It is a small piece of paradise where people go to have an exotic (ish) vacation. Unlike other Muslim countries, Turkey does allow alcohol drinking. The locals are not drinkers, but they are aware of the tourists. Even so, you will not find alcoholic beverages in all stores. You may have to look for a while. International hotels usually have alcohol on their bars’ shelves, but you can ask the locals where to get a beer from as well. Turkey has plenty of attractions to offer. You will have a wonderful time there. Just do not leave Turkey without visiting the famous Turkish hammams. You probably heard about the Turkish baths. It is an incredibly relaxing experience, and nobody in the world can replicate the Turkish hammam like the Turkish. Obviously. Other than that, enjoy Turkey, even if you are somewhat restricted.